Our vacations are often spent in search of amazing fresh food: Olallieberries on the San Mateo Coast (CA), visiting local farmer's markets, or touring a dairy and tasting artisan cheese in Richmond (UT). birthday dinners at The Willows Inn on Lummi Island (WA), celebratory meals at Hell's Backbone Grill in Boulder (UT), and incredible food events with friends and family in Napa are some of our best memories. We've also had the good fortune to have lived & worked in culinary hotspots - Napa, San Francisco, & Seattle. Inspired by Barbara Kingsolver's book, "Animal, Vegetable, Miracle", we learned about, and embraced, the term "locavore" and created a Locavore Family Reunion while living in Napa. In Seattle, Veraci Pizza's de-lish wood-fired pizza at the Ballard Farmer's Market warmed our bellies, souls and palates. Roger, the Chef Co-Founder, was schooled in engineering and was literally a rocket scientist, However, his passion is food. Roger's true joy is cooking for others, seeing them smile, pause, and savor the food he creates. Roger's engineering background served him well in the summer of 2013 when he went onto YouTube, learned how to build a brick oven, and built the RoadRunner Pizza oven himself. programs. This complements Roger's food creativity and together we make beautiful food, and food stories. 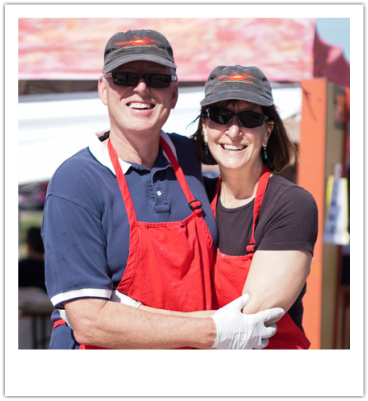 The memories of great food journeys, wonderful meals, and delicious food shared with friends, family, and business colleagues, and Roger's love of cooking inspired us to create RoadRunner Pizza. We love celebrating good, flavorful food and now we're sharing the common bread and good times with Utah friends.